It’s beginning to look like fall around the Crossroads! 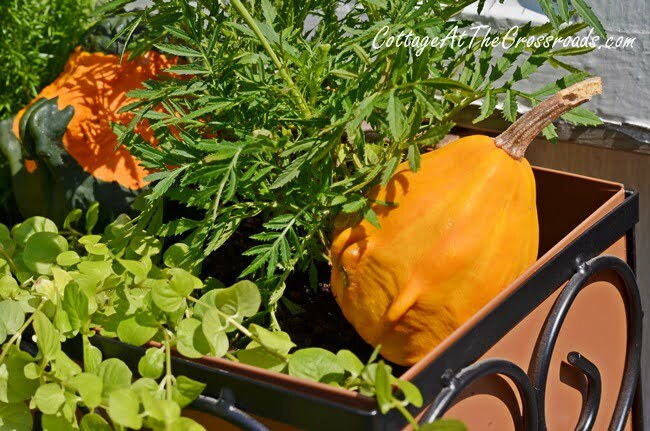 These are some new window boxes that I recently planted, and I plopped in some gourds that we grew in our garden over the summer. 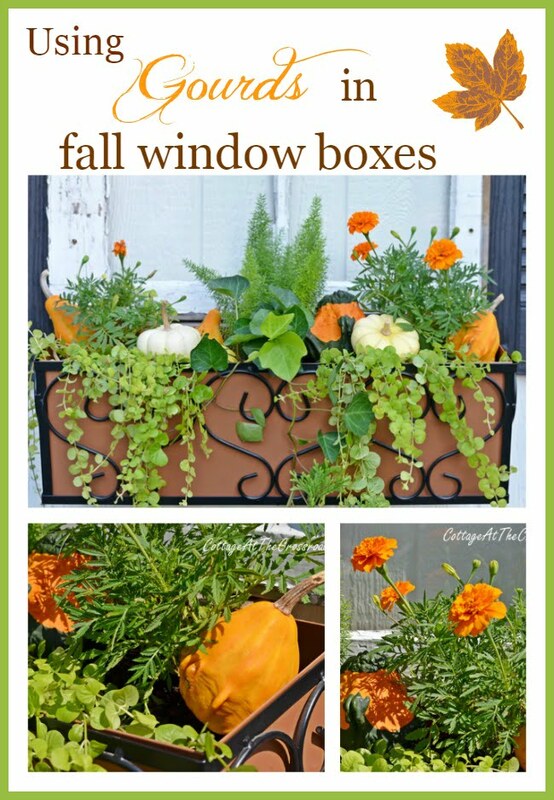 Instantly I had some fall window boxes! But first, I have to tell you where these window boxes are. 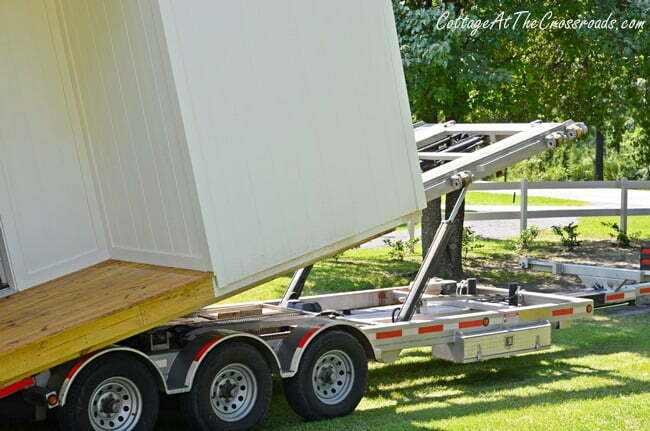 About a month ago, we purchased a new storage building, and this photo shows it being delivered and set up in our yard. You can see that it’s rather plain on the front. We didn’t have real windows placed on the front because we wanted the space to stack storage bins from the floor to the ceiling. So the first thing that we did was to find some old windows and purchased some shutters to decorate the front of the building in a similar way that we did to Leo’s shop. Once the windows and shutters went up, I knew that I wanted some window boxes and I found some pretty black and copper colored ones at Lowe’s. They were designed to hang over a deck railing, but we managed to get them attached to the building. 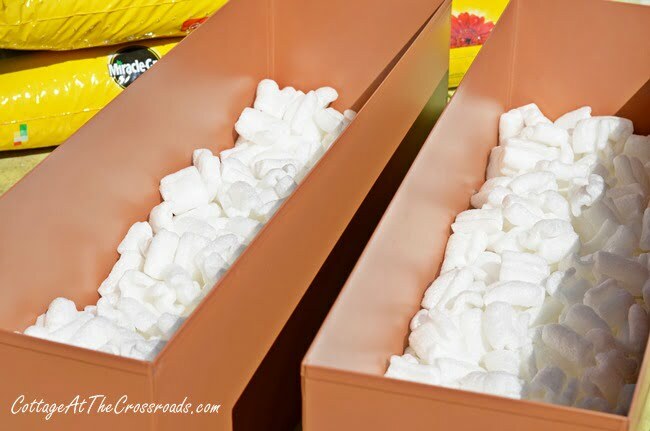 Since window boxes tend to get heavy when it rains, I put a layer of styrofoam packing peanuts in the bottom before I added potting soil. I planted them with some English ivy and creeping jenny to spill over the edges, and then I put 2 orange marigold plants and 1 foxytail fern in each box. 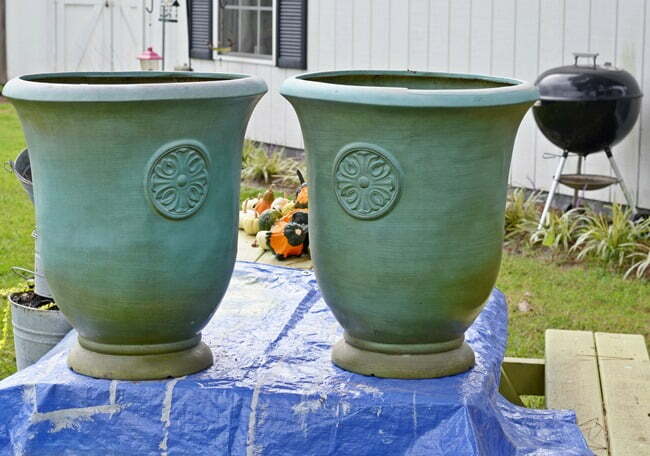 The black urns used to be in our flower garden. The plants had outgrown them and they were looking a little faded, so I spray painted them black and then planted them with some small cedars. Here’s a close-up of that foxytail fern that I was telling you about. It is very similar to an asparagus fern. Freezing temperatures will turn it brown, but the roots will live and it will come back in the spring. And since I already had some Baby Boo pumpkins and lots of gourds, I just tucked them into the boxes. The Baby Boos grew in our compost bin from where I had tossed some last winter. And so did the gourds. 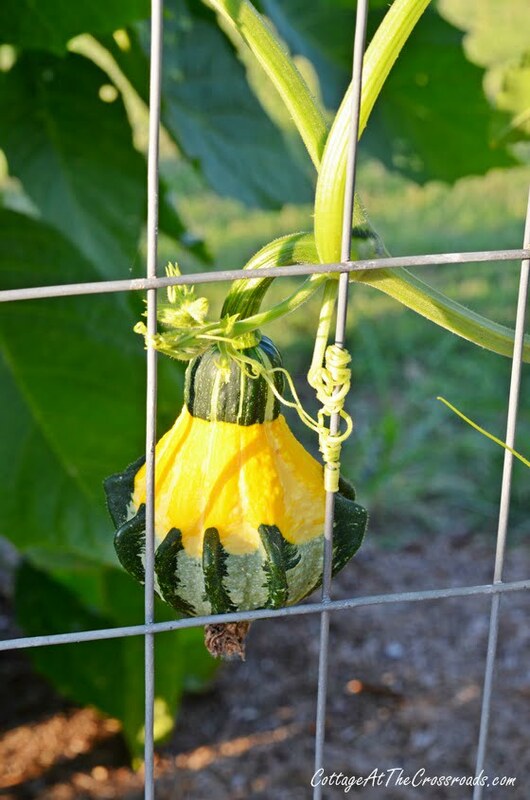 Some of the starts got transplanted around the fence of our garden, and I was rewarded with all kinds of interesting-shaped gourds which looked totally different from what I threw in the compost bin last year! That’s because those were hybrids and the next generation looks nothing like their parents! 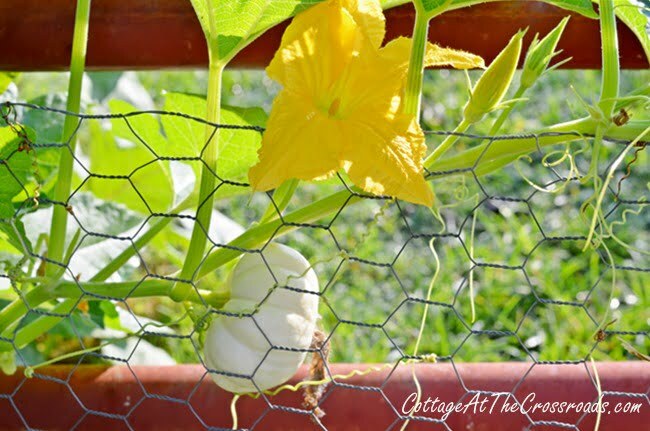 But I was delighted to find a few white pumpkins growing as well. The funny thing is that when I pull these starts out of the compost bin, I never really know what I’m transplanting. That’s because pumpkins, gourds, squash, melons, and cucumbers all belong to the family Cucurbitaceae and they all look alike in the beginning. It’s only when their true leaves develop that you can tell them apart. After harvesting the gourds, I dipped them in a mild bleach solution and set them out to dry and cure on our picnic table. And many of them found their way into the window boxes. 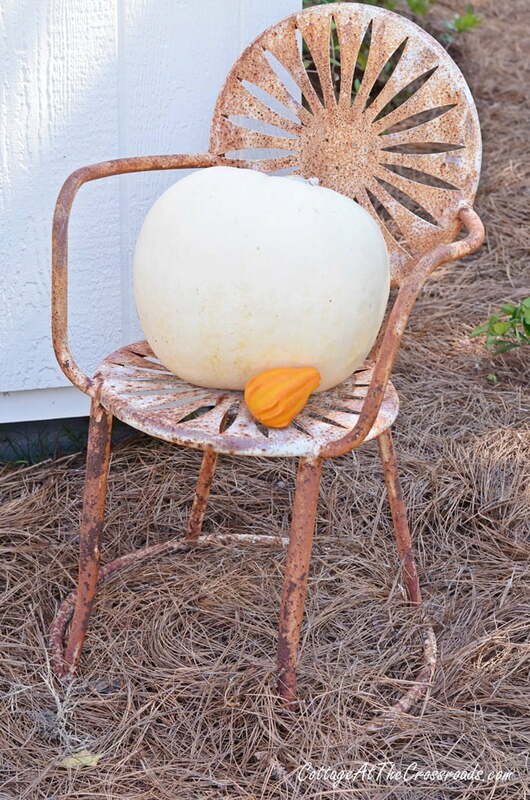 Here you can see a small round gourd beside a large, warty one. And some of them are solid orange. 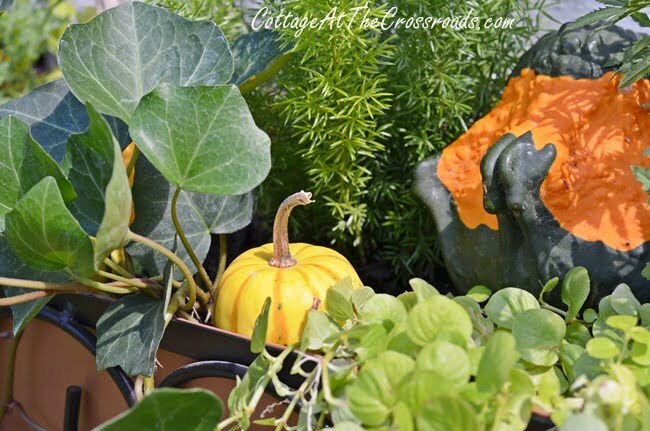 The pretty colors of the gourds sure do add a lot of interest to the boxes and give them some fall flair. 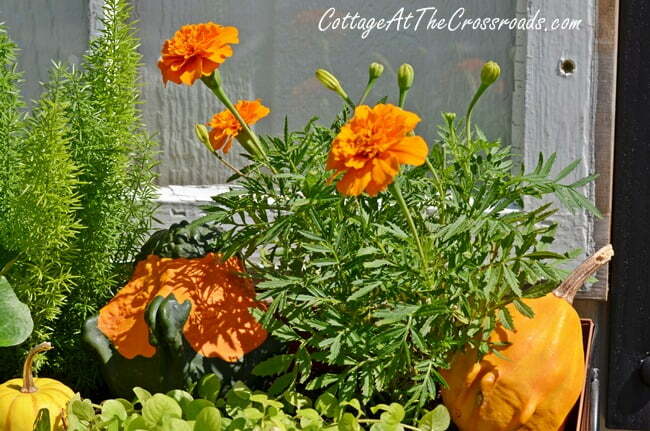 When it gets cooler, I will pull out the marigolds and replace them with some pansies that will flower all winter. 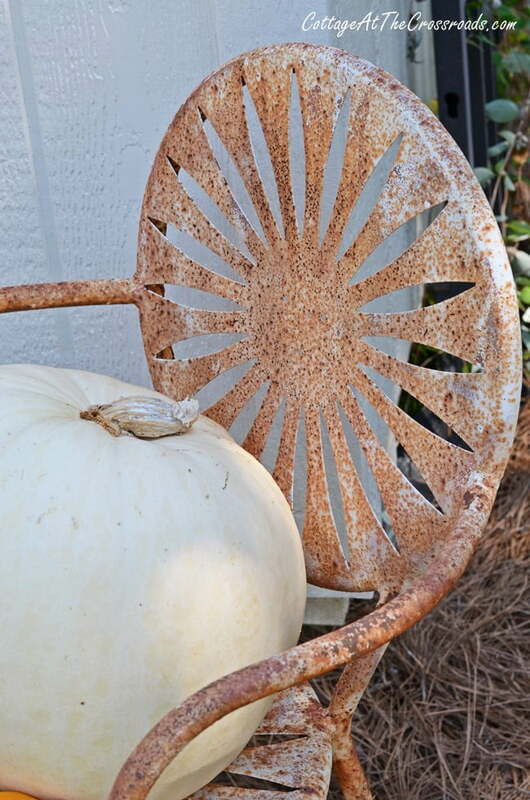 I haven’t fully finished decorating and landscaping around the new little building, but I did pull over this rusty, vintage chair to hold the largest white pumpkin. We found the chair early in the spring at the auction, and we thought about sand-blasting it and painting it. But right now, I’m loving it’s rusty goodness! 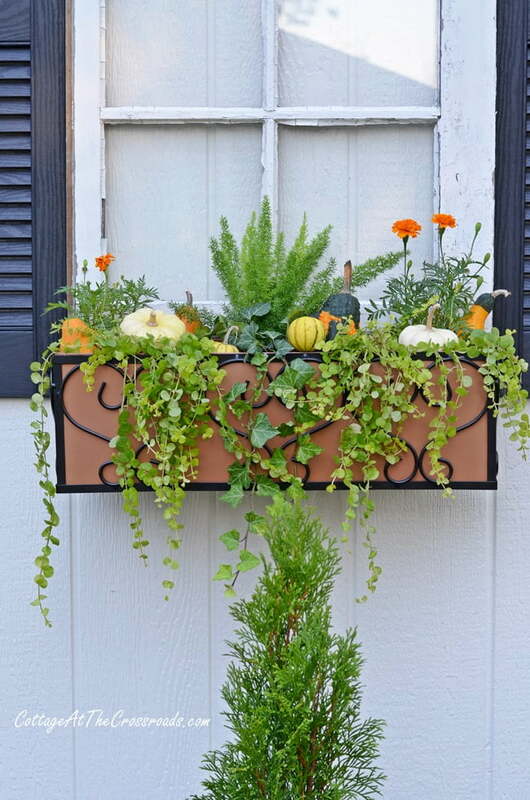 Yep, it’s definitely beginning to look like fall around here with these gourd-filled window boxes! « Using a Dremel is a Hoot! It’s all so beautiful, Jane! 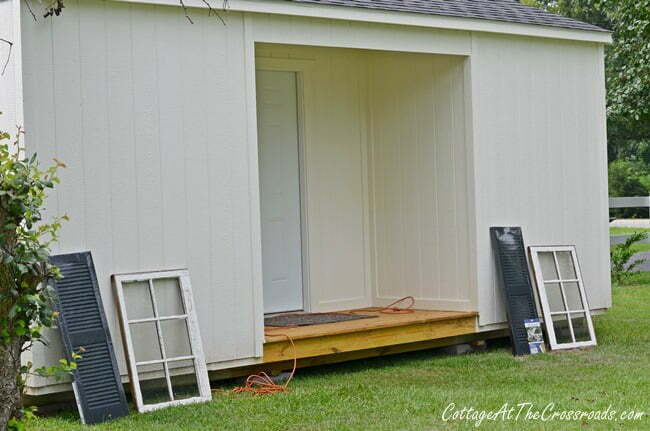 Putting the windows on the storage shed was ingenious! I just love your place and what you and Leo have done with it! 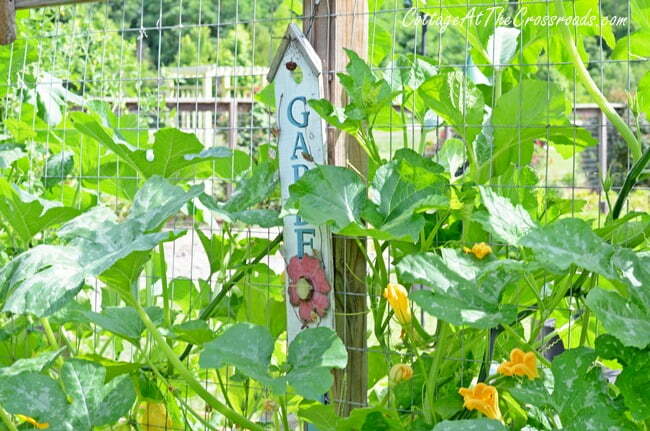 Lots of time when we’re headed to the beach, we ride by and look at your beautiful garden! You have such a flair! Love your new storage building and the planters are gorgeous! I just discovered your blog. I love the way you added the fake windows and window boxes. Genius idea. It’s beautiful. I love your storage building! Can you tell me where you ordered it from? You also did a great job with the window frames, shutters and window boxes. Looks ready for Fall! Love how you dressed up the storage shed, and great redo on the urns! My window boxes haven’t looked better all summer, still overflowing with beautiful flowers, so I couldn’t rip them out! Maybe mid Oct. when it cools down. It was 82 here today, definitely still summer in NY. Well you’ve given me the bug to start decorating for fall too. I’ll have to go to a couple of nurseries and see what i can find. I live in zone 6 will that fox tail still live through the winter here ? The storage unit looks just great. You have so many good ideas thanks for sharing. Now that is so cute! I never would have thought to put windows on a shed. That look is adorable! I am going to use your idea on our ugly cement block well house! Thank you! Jane love the new storage building and the guords are gorgeous. I love buying them with my pumpkins. I have many plans for the house when they are available in NJ. Love that rusty chair! Absolutely adore the window boxes! Great job. Jane, I think they are gorgeous! The best pumpkins we ever grew came from our compost heap at our old house… trailed across the yard, grew huge and orange. NO CLUE what they were, but we gave away tons of them that year! Oh my gosh I just got so many great ideas! The one about the packing peanuts is brilliant. I am going to do that in my galvanized buckets on my front porch. I was wondering how many bags of potting soil I was going to need! I think those windows are fabulous. I think it’s so great that you and Leo do all this stuff together. Makes it so much more fun! 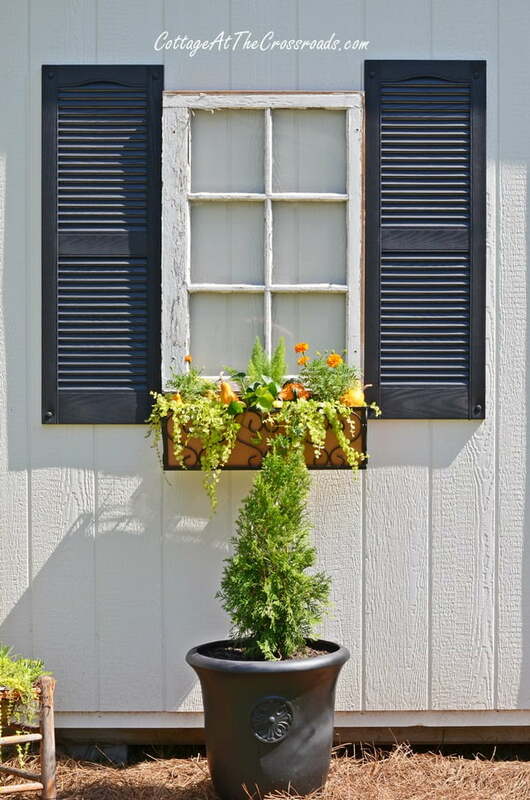 Love the gourds in the window boxes…and LOVE the new storage shed….the windows with the shutters and window boxes are so wonderful and creative!! !…Great job you two!!! It sure does look like Fall! 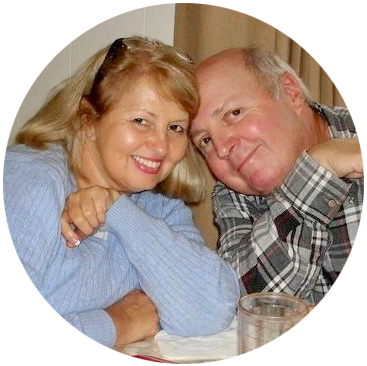 Beautiful…….and I LOVE how you created the windows. Great job! I love your creative way of decorating a plain building! The window and shutters are brilliant and your flower boxes finish it all off beautifully! Going out today to get my Fall stuff! Jane, I love the shed, love the windows, love the rusty chair. It’s all perfect and the window boxes are fantastic. It looks so bright and sunny there:) I did the same to my moms garden shed but I put mirrors behind the fake windows and it gave the illusion of a real window reflecting the gardens. 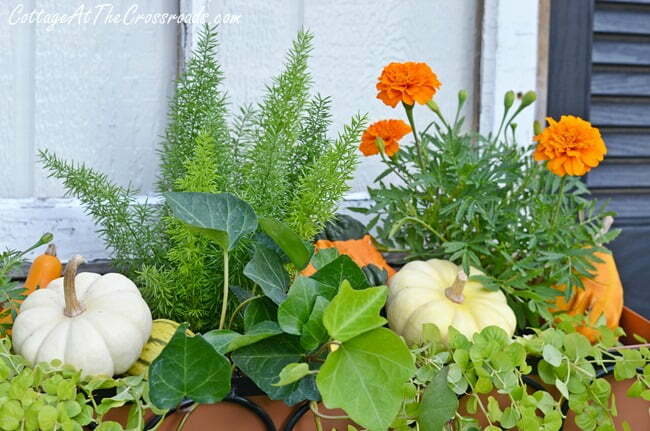 I love your gourds and pumpkins in your window boxes and how smart of you to add the windows, shutters, and window boxes without taking up any of your valuable storage space! Yep! That is indeed looking fallish! I love your window box idea Jane. You and Leo are so darn clever and cute. Please leave the chair – it’s gorgeous! I was looking for some lovely warty gourds, but no-one grew any around here last year. I will definitely be looking for some seeds to grow my own next year.